It would be easy to dismiss The Good Dinosaur‘s simple narrative as minor Pixar. The tale’s themes touch upon the importance of family and finding your place in this world. These lessons have certainly been done before. But delve deeper and what the studio has done here is no less magical than some of their very best. In many ways, the blend of ideas is one of their most subversive. To begin with, it relies on less dialogue than virtually all of their productions. They explored this abstraction in the first half of Wall-E then abandoned it in the second. A cursory look at production stills show a little boy and his dinosaur, a seemingly clichéd set-up that suggests that the dinosaur is a substitute for the boy’s proverbial dog. Leave it to Pixar to flip the script. The saga begins with a vignette that might not even register if you’ve managed to avoid press materials for this picture. An asteroid flies overhead. Dinosaurs look up. Go back to eating. What the visual tableau is hypothesizing without words is, what if the theoretical asteroid that was supposed to hit earth rendering dinosaurs extinct, never did. How would they evolve, and even more intriguingly, how would they interact with humans? The answer is one of Pixar’s most radical concepts. Naturally the dinosaurs talk. Animals do that in animated films all the time. But Pixar takes the conceit one step further. They’re now highly evolved creatures, developing a sophisticated ecosystem. They grow crops, store grain in a silo and raise what appears to be dino-chickens in a coop. Pixar has designed a fully realized world that pushes graphic technology to the next level. The plot concerns an Apatosaurus family. There’s Poppa Henry (Jeffrey Wright) and Momma Ida (Frances McDormand) who witness the birth of their three children at the outset: Libby (Maleah Padilla), Buck (Marcus Scribner) and runt of the litter, Arlo (Raymond Ochoa). Though the main character is cute and cartoonish, the environment created is not. To say this is the studio’s most visually impressive movie, is an accomplishment that should not be taken lightly or negated. Some of these awe-inspiring landscapes are photo realistic achievements that dazzle the eye. This isn’t a film, it’s an experience. You can get lost in the mood, particularly during the wordless spectacles. After a not so spectacular intro, something tragic happens (Pixar is known for this) and young Arlo is separated from his family. He meets a caveboy named Spot (Jack Bright). Spot is an unexpected individual full of facial expressions and body language. His dirty mangled hair, fair skin, slightly red from the sun and piercing green eyes embody a mesmerizing soul that captivates with tangible cues. In one episode he forages for food and offers some to Arlo. The moment manages to be funny, gross and tender in mere moments. The charm slowly sneaks up on you. I fell in love with this kid. The Good Dinosaur is a deceptively slight narrative that belies a philosophical exploration of humanity. Is it about a spirit journey? Is it a coming-of-age movie? Is it a western? Pay attention, because there is a lot being covered. Much of the drama evolves like seeds that grow in the mind well after the film is over. It stays with you. Let’s start with the notion that fear is something you learn to live with, not conquer. That’s pretty “out of the box” thinking for a children’s story. Oh but there’s so much more. On the surface, you might not even realize what’s being promoted here because it’s never expressly stated. The evolutionary relationship between Arlo and Spot is a completely subversive idea that caught me quite by surprise. Pixar has drawn inspiration from classics of the past. The close alliance between two species has been explored before. There are many examples but perhaps never done better than in something like The Black Stallion. The Good Dinosaur ranks up there in tender sophistication. When Arlo and Spot “discuss” their families, the communication is a pantomime where sticks are used. Their interaction presents a harsh reality in such a refreshingly simple way, it’s profound. The scene is heartbreaking. I’ll admit I teared up. Ok Pixar, you win again. This entry was posted on November 25, 2015 at 10:18 am and is filed under Adventure, Animation, Comedy, Family, Fantasy. You can follow any responses to this entry through the RSS 2.0 feed. You can leave a response, or trackback from your own site. Great review! I couldn’t agree more. I did a youtube review but will post my blog review later over holiday but I had a similar response as you did. I love you said it is more an experience than film. I saw it in 3D and it really is. I loved Spot also so much. I think the films greatest flaw is opening same year as Inside Out but I really did love it. I watched your YouTube review and I really enjoyed your exuberance for the film. Spot was such a delight. What a creation. His personality was so different from what I was expecting, but it was a pleasant surprise. I love when that happens. Sure people will compare this to Inside Out, but it’s like apples and oranges. They’re both good, just appeal to different tastes. There’s room for both. Pixar, you’ve done it again. Wow. Nice score. This is a movie I have paid no attention to. Sounds like I need to correct that. Good review. I enjoyed this movie morr than I expected and Jay absolutely loved it! A deceptively simple narrative believes a rather deep study of Arlo and Spot’s friendship. I look forward to adding this to one of my double-feature trips to the theater probably next week. Our area just got hit with a triple whammy: ‘Brooklyn,’ ‘Trumbo’ and ‘Spotlight.’ I’m overwhelmed with options right now but strapped for cash! Broolyn is a landmark. I’ve seen it twice and it gets better with repeat viewings. Spotlight, is very good and the frontrunner for Best Picture at the moment. Trumbo, haven’t seen….yet. It wasn’t well received. I really don’t really understand why. Even without adjusting for inflation, this is by far Pixar’s lowest grossing movie ever. It earned even less than A Bug’s Life which came out in 1998, 17 years ago! DreamWorks’ Home and Sony’s Hotel Transylvania 2 performed better this year. 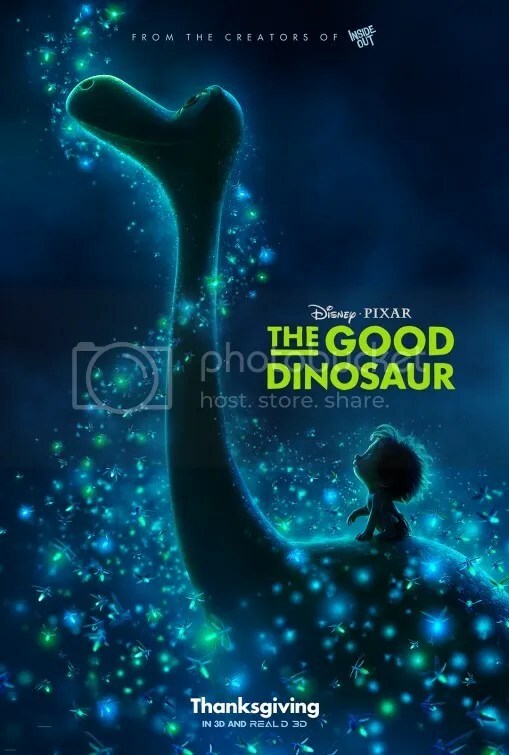 I wasn’t a big fan of The Good Dinosaur, but you did get me thinking a little harder about it with your comments on how it’s subversive (the boy/dog flip and how dinosaurs might evolve if they were still here today). I agree that the environment is dazzling, although I didn’t like how the cartoonish look of the characters clashed with the realistic backgrounds. I felt that its exploration of so many different topics was unfocused and its potty humor between Spot and Arlo was off-brand for Pixar. Not a terrible film by any means, however I didn’t think it belonged in the same league as Inside Out. Whatever brief lapse into potty humor that occurred must’ve been awfully mild. I’d be hard-pressed to remember any objectionable content in this film.